If you decide to balance your checkbook, you can try different ways. One of them is the control of the family budget using MS Excel. This allows not only to systematize the flows of costs and revenues, but also significantly reduces the time spent on calculations. 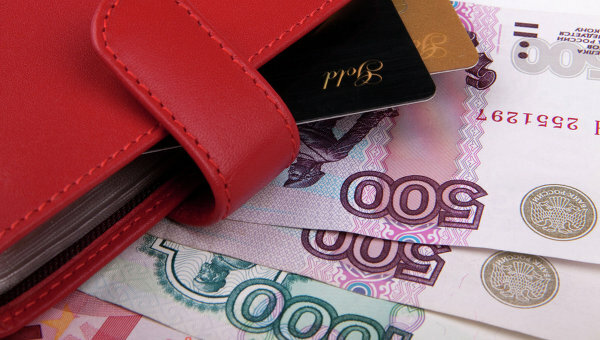 Consider the management of the family budget for example a simple table with a weekly plan of income/expenditure per person with a detailed explanation of the introduction of formulae for data calculations. 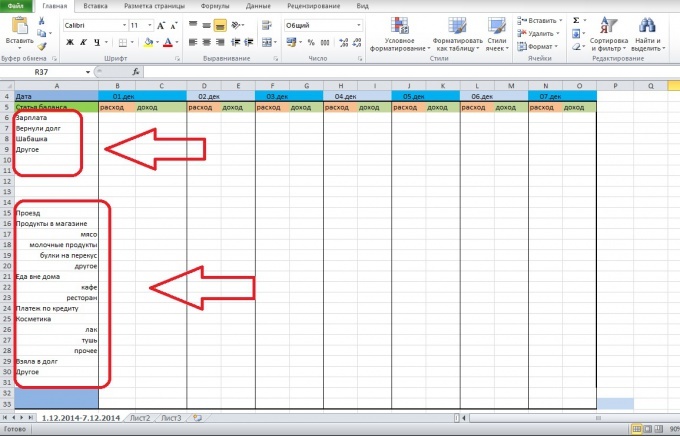 Create an Excel document and name the first sheet so that then distinguish different periods. For example, 1.12.2014-7.12-2014. Better to call sheets by date to avoid confusion. At the same time to keep the books in a long period, it is not necessary to write only on one sheet. Break the period into several parts, for example, a week or a fortnight. This will improve the perception of information from the sheet. Think about how you want to decorate your table with the future balance. You can create a separate template, copying expenses/income, or create a table directly on the company. The table may look like a standard balance sheet or articles to be arranged in columns. For a simple table suitable pattern for the period. Enter the expenditure and revenues in the appropriate column of the table. You can put in that order in what you want, but, for the convenience of calculations, it is better to group income and expenses. You can learn more about paint expenditure, then to understand under what article of consumption is the highest, also, whether these costs are really important to you. Usually funneling money little by little on small household items, snacks in the cafe, etc. Also add the article the "Other" for those expenses and income that you can't remember or they are not included in a separate group. 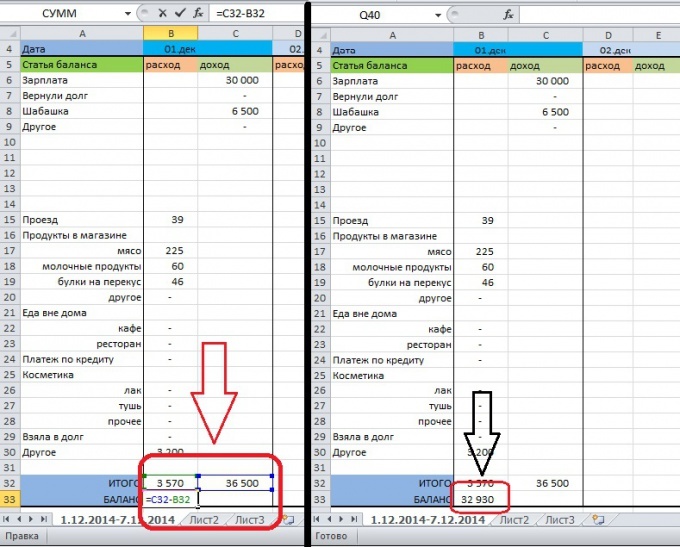 In the column items of expenditure and income in the very end, add the column "total". In this line, you will be able to track how much in total was spent or earned for the day. Also, you can add the Balance column, there will be reflected the amount of money you have left after deducting all expenses. If the balance is negative, you got into debt, and the money that you have on hand, in fact not yours. Insert below the table, or wherever you are comfortable, place to review. There you can write important things for you to determine what you spent the money in the column "Other", etc. Write down all income and expenses for the day in the appropriate column so that the data on expenditure was recorded in the column "expenses" on the appropriate date. Do the same with the data on income. To format numeric data, use the Home tab, Number section. Next, we prepare articles for the total and the Balance to be automatically summarized income and expenses. 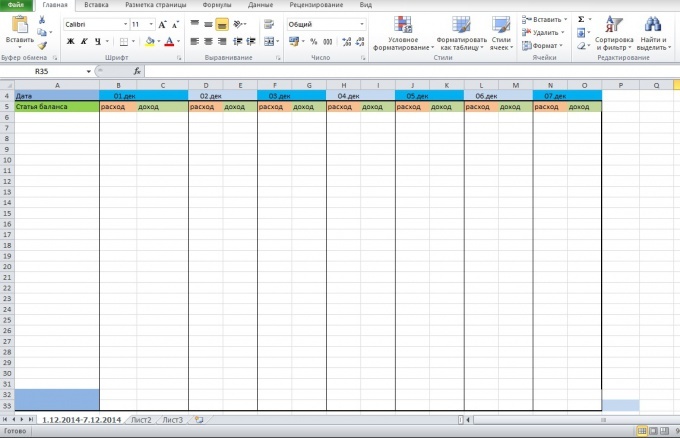 To do this, select the cell total consumption(1.Dec) and to put in the " = " sign to enter a formula. Here you can use a simple sum by typing "=SUM". Then highlight the data you want to sum and press ENTER. The result of these actions should be the emergence in the cell of amount of the expenditures for the day. Do the same with your income. To insert a formula in the balance column, select the cell Balance/expense or Balance sheet/income for 1.Dec. Next, put in it the " = " sign, select a cell, total/income (in the formula bar, shows the number of cells), check the "-" sign and select the cell total income. Press ENTER. After this cell will be your income in 1.Dec minus expenses. This is the money that you can use. 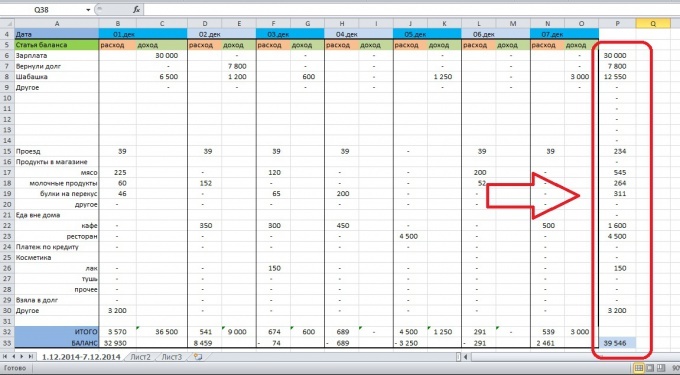 Not to do every time the same operations on the application of the formulas in the rows, select the cells total consumption And total income, then drag them to the end of the table. After that, the total row will appear in the formula. 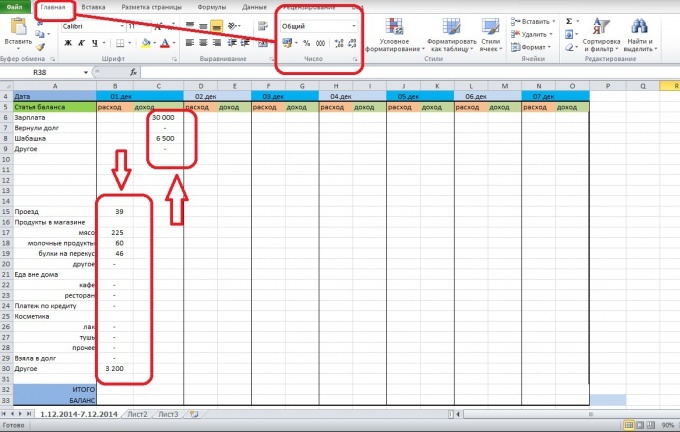 To check the correctness of the copy, select any cell in the total row to place the cursor in the formula bar - should be allocated to the area of summation. In the same way dispense a formula from the cell Balance. Select it and the cell next to the formula was not copied into each cell, and through one. 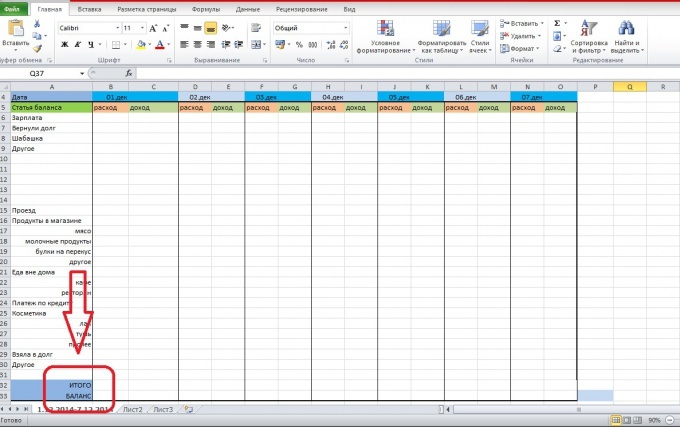 Drag the cell to the end of the table and verify the copy of the formula as in the previous step. To understand how much money you have left at the end of the week, add up the cell Balance for the entire period. 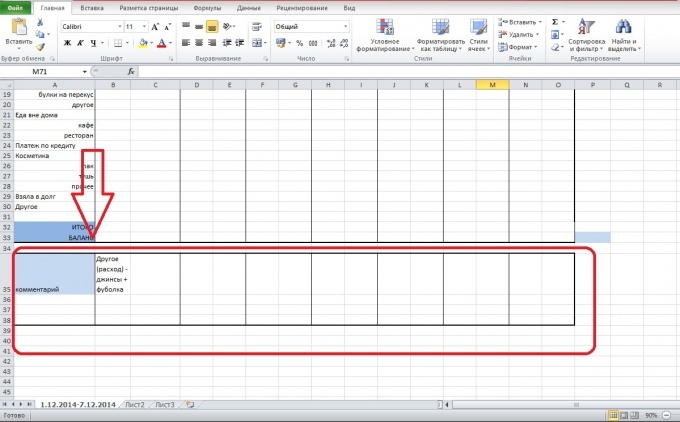 You can output the data to the right of the table. In the same way you can sum up all items of income/expenses and see details data flows. To sum a row, click in the cell in which you want to enter data "=SUM" and select the line, press ENTER. Note the formatting of the table. The better you delineate the different categories, the easier it will be to navigate in the data. When copying formulas, always check whether they are count data. 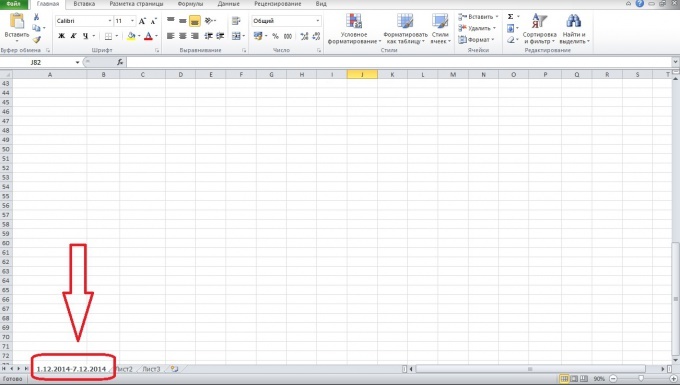 To do this, simply select the cell with the formula and see what an array of data it processes. Such a table is the simplest but the compilation of the template can be time-consuming, if you have not worked with Excel. You can paint the details of income and expenses in order to understand more clearly how and where you spend. Such a table can be on multiple people, and to simplify the search data to allocate each group of indicators is color. You can go ahead and make the schedule of income/expenditure for clarity. Try to make sure that the table is not continued beyond the boundaries of the PC screen. So you will see what article you write.